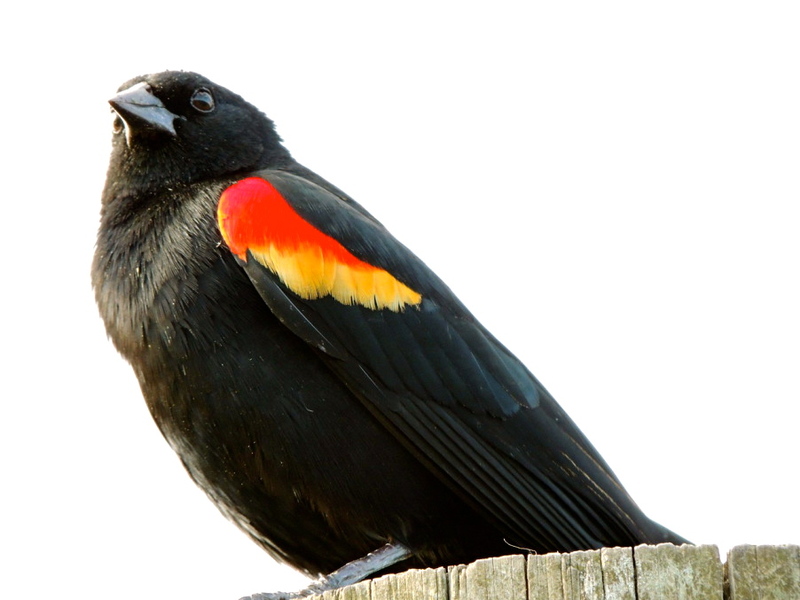 This red-winged blackbird looks so proud of himself. Would you like to hear him sing? Sylvia, that’s one of the best photos of a Red-winged blackbird I’ve seen. The angle and the white background really do him proud. Great photo and thanks for including the video – birds are fascinating! Have never seen one like him before Sylvia. What a beauty! What a beautiful capture! I’ve been trying (without success) to capture a red-winged blackbird. They never cooperate! Well, you should know! 😀 Thanks, glad you approve. That red on black makes for a stunning bird. Thanks, Annette. I’ve never seen more than one at a time here. but I can imagine the noise that a crowd of them can make. :). Beautiful design. A small patch of red with the black background. Beautiful bird..I have never seen it before. What smart and colourful epaulettes he has! And I would like to hear his voice,too! They’re really handsome birds. We have a few here in Florida, but I don’t see them very often. Oh he’s so beautiful, Sylvia!